With a serial killer hitting close to home, Lizzy Gardner and friends fight to get to the bottom of the murders. Through the eyes of A Dark Mind, we’re taken through the abysmal pit of the passion of death. I found this book very suspenseful! Any book that can have me staying up to finish it at five in the morning is aces in my book; I couldn’t put it down! I became anxious, with each chapter, to find out what the Lovebird killer was up to next as he turned his focus on Lizzy Gardner for ruining his idol, Spiderman. A lot of things that happened in this book also made me want to read the first two books, because it looks like a lot has happened to Lizzy to make her so paranoid and jumpy, but this book is also good being read out of the series. I admit I was a bit confused and frustrated when the timeline kept jumping back and forth, but it really made a lot of sense in the end, as it explained the Lovebird killer’s attitude and actions. Another thing that got a little frustrating were the sheer amount of people in the book; there became so many names that I had to sit and think for a moment on who the person was before moving on. This probably could be remedied by reading the first two books and getting to know the main characters better first. “...he listened from the kitchen and was surprised to hear them talking about one of the boys having a dark mind. After I got used to the book’s structure, with it’s multiple point of views and characters, I easily became engaged in each person’s storyline. The author, T.R. Ragan, does a great job in description and characterization because I could feel the characters emotions and see their actions as if they were real. Everybody was different and had a different background, and they all worked for this book. I enjoyed seeing Lizzy’s growth and empowerment from being constantly scared to standing her ground and staying determined to find the killer. I also liked Hayley (although I don’t know here that well yet,) softening her rough spirit towards people she normally wouldn’t have thought to get along with; her character really reminded me of Lisbeth Salander from Stieg Larsson’s Millennium trilogy. The ending, dealing with Hayley is brutal! I know I want to read more about that! In all, I am stoked both to read the first two books of this series, and to read whatever comes next. This book, personally, was right up my ally as I recall “serial killer week” in my psychology class, years ago in university, was the most exciting week. 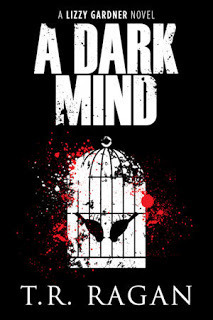 A Dark Mind delves into the soul of a serial killer and helps us analyze how the person got that way, and even let’s us see the world through their eyes. I recommend this book to those who love a good thriller with suspense and intrigue.